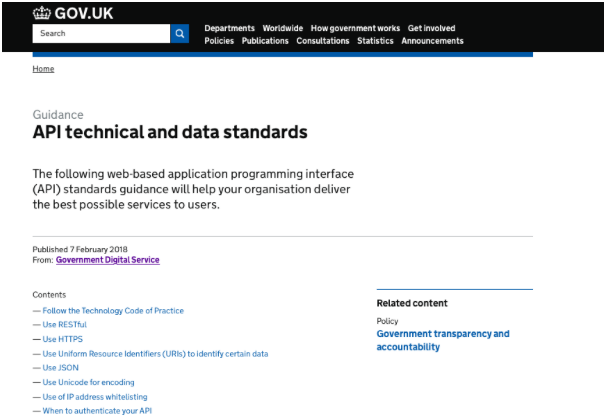 We are pleased to launch the API data and technical standards, which is the culmination of fantastic cross-government collaboration, facilitated by GDS. These API standards will help us as central government and local authorities build, authenticate, iterate and document APIs in a consistent way. APIs are important as they help government organisations share and reuse technology and make better use of data, as required by the Technology Code of Practice and the Government Transformation Strategy. These API standards are to help us provide better digital public services and reduce our costs of doing so. We started by drafting up guidance working closely with subject matter experts such as technical architects. We checked to see how the guidance aligned with industry standards and the standards used by other government organisations such as 18F, a technology team inside the US federal government. Subject matter experts from central and local government helped us to peer review the guidance through a mix of face-to-face ‘brainstorming sessions’ and online collaboration tooling. We received input from a variety of organisations including HM Revenue and Customs, the National Cyber Security Centre, National Health Service, Home Office and Ministry of Justice. We then submitted the guidance for feedback and sign-off from the Technology Leaders Network. 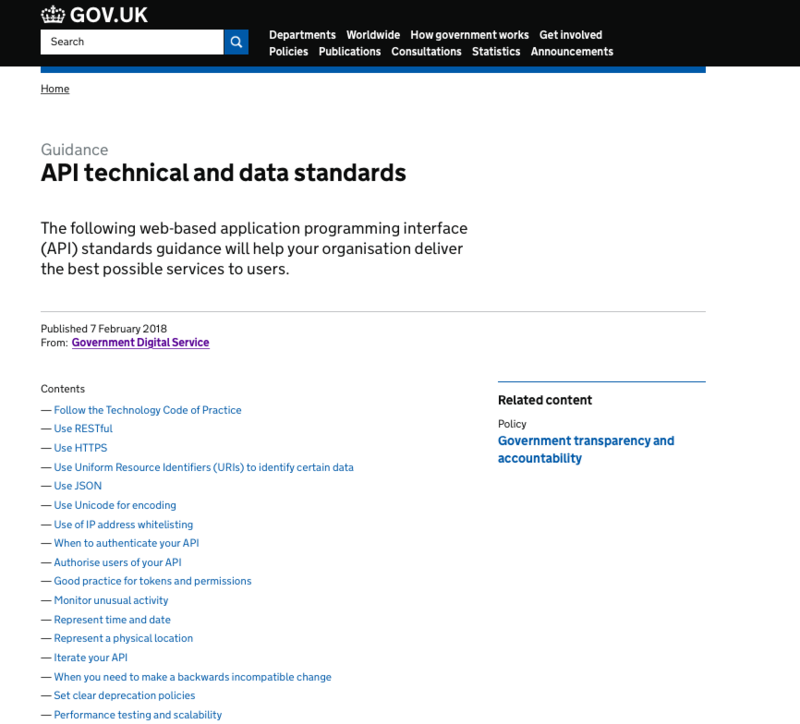 We published the API standards after the second cross-government API event at GDS on 1 February. Over 60 attendees from central government discussed ways to solve the challenges of using APIs in the public sector. GDS is working on guidance in a number of these areas in collaboration with other departments to help meet the needs of those creating APIs and those using them. If you would like to help iterate the cross-government API standards, please leave a comment below. Stay up to date with all the latest posts by signing up to alerts from Government Technology blog. I would be interested in seeing the feedback you collected around these standards please. I am currently working on API Standards internally in my department and it would be useful to be involved in your process. Hi, I'd be really interested to contribute to discussions on this. I am part of an open source, UK based, API Management platform. We'd love to see more GDS projects adopting standards-based API management, facilitated by open source platforms, rather than proprietary offerings from big US firms. How can we engage in the discussion? As it happens I'm currently doing some research on this area (specifically API Management Platforms) within GDS. I've followed you on Twitter: if you're able to follow me back we could start a DM conversation. We've emailed you about these separate queries. It would be good to talk to you both. Interesting to read that the Physical Location standard has been mandated to ETRS89 for Europe. This standard is not currently supported by Ordnance Survey map APIs, and I'm not aware of it's use in UK government. Who was consulted on this standard please? The original consultation was done back in 2015 - we spoke extensively to Ordnance Survey and other providers / users of geographic data. Data sets covering European locations must also publish in ETRS89 to comply with INSPIRE Directive 2007. For a lot of practical purposes, ETRS89 and WGS 84 are the same. There is currently a ~60cm difference, changing at ~2.5cm/year. This is a sufficient level of granularity for a lot of real-world applications. Ordnance Survey provide a transformation for ETRS89 at https://www.ordnancesurvey.co.uk/gps/transformation/ - but you'll need to speak to them to see if they can change specific APIs to accept it directly.